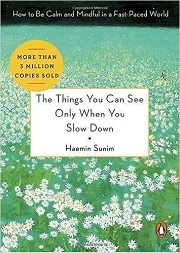 SEOUL, South Korea -- "The Things You Can See Only When You Slow Down" by South Korean Buddhist monk Haemin turned out to be the best-selling Korean essay in a decade, a local online book store said Monday. Online bookshop Yes 24 said an analysis on sales of essays over the past 10 years shows that Ven. Haemin's book tops the list. The book, published in 2012, became an instant best-seller for a whopping 39 weeks and has maintained a unwavering popularity for many years since. Last month, the English version was published by Penguin Random House (PRH). Another book of his, whose title is roughly translated as "Love for Things Imperfect," ranked fourth in the essay section. Noteworthy is that there are two more essays written by Buddhist monks on the list, which came in eighth and ninth, indicating that Koreans seek comfort from words of wisdom offered by religious leaders. The top ten is dominated by Korean authors. Paulo Coelho's "Like the Flowing River" came in 14th. "Essays that are written by Korean authors and reflect the social atmosphere have been popular. More recently, books that talk about living an independent life are gaining a growing popularity," said Kim Do-hoon, an official from the company.